AMD AM3 Phenom™ II/Athlon™ II/Sempron™ 100 Series Processors. Supports AM3 45 nm CPU. Supports CPU up to 140 W.
AMD Cool 'n' Quiet™ Technology. 4 x DIMM, Max. 16GB, DDR3 2000(O.C. )/1333/1066 Hz Non-ECC, Un-buffered Memory. - System Bus: Up to 5.2 GT/s HyperTransport™ 3.0. Integrated ATI Radeon™ HD 4250 GPU. Multi-VGA output support : HDMI/DVI/RGB ports. Maximum shared memory of 1024 MB. SidePort Memory - onboard 128MB DDR3 1333 memory. Dual independent displays support with HDMI/DVI and D-Sub. Hardware Decode Acceleration for H.264, VC-1, and MPEG-2. Supports DirectX 10.1, OpenGL 2.0, Shader Model 4.1, Universal Video Decoder (UVD) 2.0. - Multi-GPU Support: Supports AMD CrossFireX™ Technology. 1 x PCIe 2.0 x16 (x4 mode). 1 x PCIe 2.0 x1. 1 x UltraDMA 133/100/66 for up to 2 PATA devices. 5 x SATA 3Gb/s port(s). 1 x eSATA 3Gb/s port(s). Support Raid 0, 1, 10, JBOD. Realtek® 8111E , 1 x Gigabit LAN Controller(s), featuring AI NET2. Realtek® ALC 892 8-Channel High Definition Audio CODEC. Supports : Jack-detection, Multi-streaming, Front Panel Jack-retasking. Absolute Pitch 192kHz/ 24-bit True BD Lossless Sound. Blu-ray audio layer Content Protection. Optical S/PDIF out port(s) at back panel. 2 x IEEE 1394a port(s). (1 at mid-board, 1 at back panel). 2 x USB 3.0 port(s) (2 at back panel). 10 x USB 2.0 port(s) (4 at back panel, , 6 at mid-board). 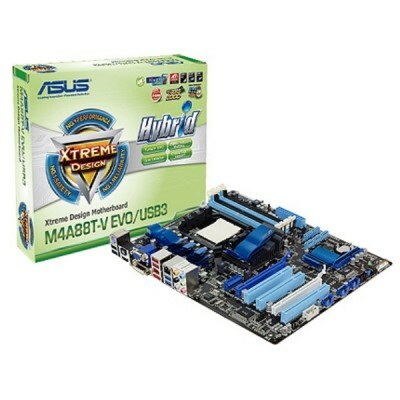 ASUS Hybrid Processor - TurboV EVO. 8 +1 Phase Power Design. Stylish Fanless Design Heat-sink solution. 1 x PS/2 keyboard/mouse combo port(s). 3 x USB 2.0 connector(s) support(s) additional 6 USB 2.0 port(s). 1 x COM port(s) connector(s). 5 x SATA 3Gb/s connector(s). 1 x IEEE 1394a connector(s). 1 x CPU Fan connector(s). 2 x Chassis Fan connector(s). 1 x Power Fan connector(s). 1 x S/PDIF out header(s). 1 x 24-pin EATX Power connector(s). 1 x 8-pin ATX 12V Power connector(s). 1 x Front panel audio connector(s) (AAFP). 1 x Core Unlocker switch(es). 1 x Turbo Key II switch(es). WOL by PME,WOR by PME,WOR by Ring,PXE. Clique no botão abaixo para adicioná-lo Placa Mae ASUS M4A88T-V EVO/USB3 Socket AM3 para sua Lista de Favoritos.